Bioware has been nice enough to let us know when their patches are actually set to release instead of springing them on us after an indefinite wait. So most of us know now that 1.3 is live, and ready to go. This lovely update grants the SWTOR community some nice updates to our gaming experience, and here’s a quick rundown. One your map, you’ll find the new Group Finder icon on the upper left-hand corner. For someone coming from the World of Warcraft Community, I have had a lot of experience with the group finder introduced during the course of Wrath of the Lich King. 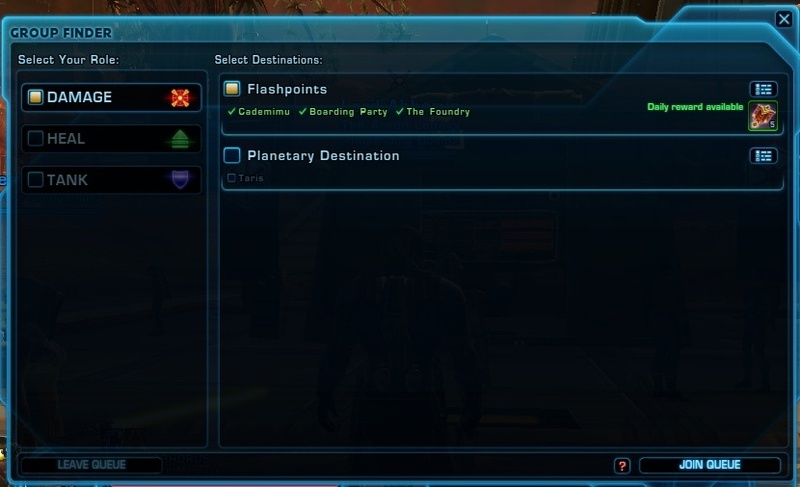 Something that did frustrate me about these first 6 months of SWTOR was not having that ability anymore, and on the near-desolate wasteland I formerly called my server, finding groups for Flashpoints and Heroic Quests was a rare and sporadic thing. Hopefully, seeing this will end that frustration. Root Menu, as seen from Level 35 Abhorus. In short, Group Finder allows groups to be automatically formed from a pool of Tanks, Healers, and DPS (as you specify) and put into either a specific or a random Flashpoint/ Operation. You have access to teleportation to the FP/OP, get bonuses from random groupings, and the system inhibits one person from Master Loot and from kicking players from the group. So, basically identical to WoW’s system. The other benefit this adds is to find people for group quests on certain planets, making doing Heroics and Dailies on any given planet hopefully easier. Assuming everyone starts using it, which I have no doubt, this should grant everyone a more convenient experience in grouping up and completing more of Bioware’s wonderful content. Our new PVP interface, only slightly modified from the old. 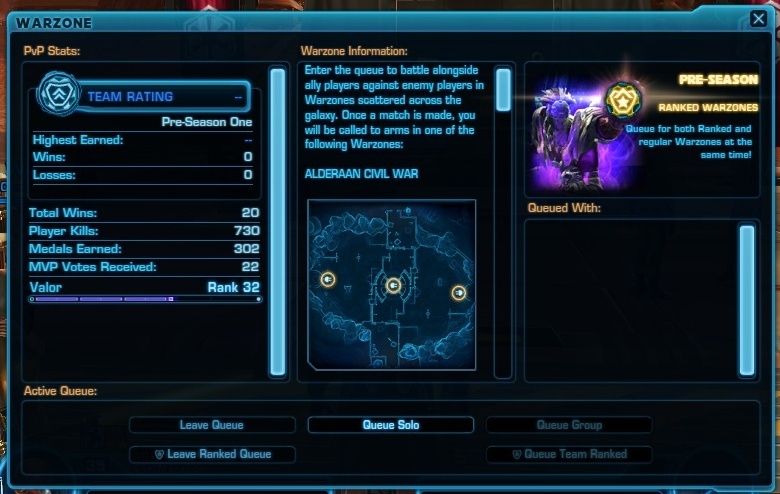 In additional to same faction Alderaanian Civil War warzones, 1.3 introduces some PVP changes, including the much-anticipated Ranked Warzones. While it is technically Pre-Season, ranked commendations for gear and hopefully a stronger pool of PVPers will improve our PVP experiences. Also, Recruit Gear for 50 PVP will be gained through quest or be reimbursed for those who already spent credits on them (320k Credits). Very nice! We also find some changes in PVP vendor items, and persistent groups for re-queue. Might I add that we no longer have a requeue option, Civil War and Voidstar have had some aesthetic changes (Voidstar has a fence between the first two doors now), and the symbols placed above turrets and glyphs for placing AOE abilities have had their colors changed. I haven’t had much experience playing this update yet, but hope to very soon with both Geldarion and Torvox. Ranked groups should help PVPers fight effieciently with their Guilds, and will be granted more rewards for their playtime. This should grant a different strata of PVP action, and hopefully this will entice some of the avid PVPers who were discontent with the current system and broken promises to return for some improved action. Now longer a “Coming Soon” Option, Character Perks are up in the Legacy System. For Heavy Credits, increases abound! These include quite a bit of increase. The set I’m most excited about are the Experience Increases. I plan on wanting to level most of my characters through PVP and Class Quests, so this will certainly help me be able to do that and not CONTINUALLY repeat the same quests as I level. Advancement: Warzone, Flashpoint, Space Mission, Class Mission, and Exploration. These are all experience increases in 5 tiers. 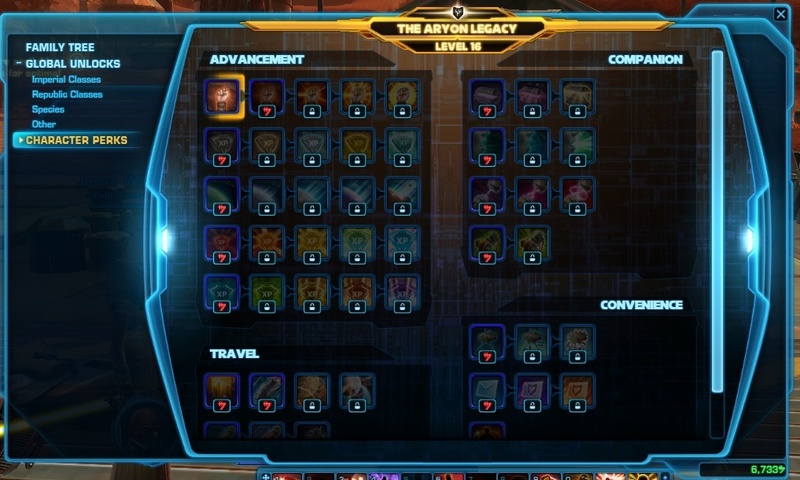 So we’re looking at 150k-275k Credits total per set, assuming you’re Legacy Level 25 (which I am currently not). It’s a 30% increase though, so from what I’ve seen through heirloom/ Guild perk increases in WoW, it does make a difference. 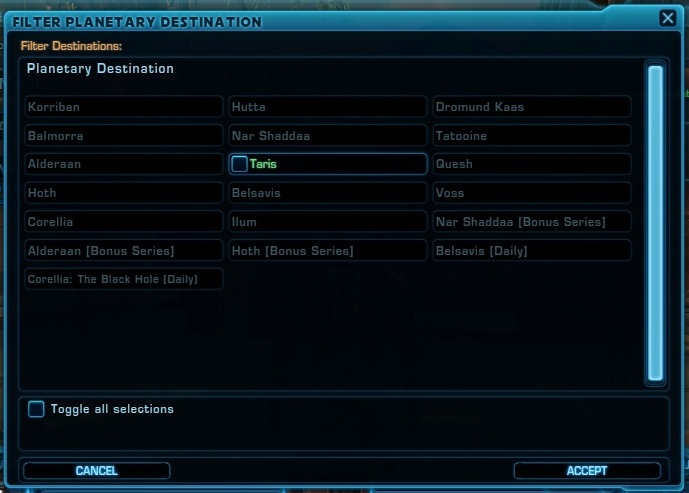 Other increases include Speeder Piloting access at a decreased level, 4 different Transport abilities (i.e. Capital World), Field Repair Droid, Field Mailbox, and Field Respec (fees still apply). There are also two sets of Companion Affection Increases, 1 set of Augment-chance Crafting Increase, and Speed of Junk Item Sales. All-in-all, I think it’ll be significantly worth the credits. The Legacy system is all about getting granted rewards for your leveling and achievements, so this just adds to that, helping you continue customizing your gameplay and reaping the rewards of your past endeavors. Item Modification Tables in the game world now provide players with the ability to add augmentation slots to just about any piece of armor/ weaponry. These items must be at least Premium (Green), you must have enough credits to cover the installation which varies, and you must have an augmentation kit of the appropriate rank. The installation binds it to your character. Also, Augmentation slots are tiered in rank, and can only accept augments up to their rank. Augmentation slots can be upgraded to a higher tier through the Item Modification Table. Additionally, Mod extraction costs have been reduced by 30%. A lot of crafters have been looking forward to this from what I’ve personally heard, so time will tell. I myself tend to not be able to keep up with my crafting, but will hopefully in the near future. Here’s to hoping our fearless leader Geldarion expands upon this, as he is an avid crafter. Crafting should become more necessary to getting an extra edge in Operations and Warzones, since the augmentations bind the items to you. A lot of changes have come, and the highlighted ones especially look to help strengthen the game. For full patch notes from Bioware, here’s the link: http://www.swtor.com/patchnotes/1.3.0/allies . Thanks for clearing that up. Clearly I was mistaken on that.